After Christmas and a huge car repairs bill we really are tightening our belts. This means that I have not got as much as I usually have to spend on our weekly shopping. I cook our meals from scratch so it is not too hard to cut back here and there. One way that I have always found I can save money is by meal planning for the week. I look at what I have in my freezer and work meals around what I have in and buy what I need as opposed to buying willy nilly. I also love looking on the reduced meat and fish section in the supermarket. Most, if not all, of the meat and fish that is on offer can be frozen so if they have any good offers I stock up my freezer for a cut of the regular price! 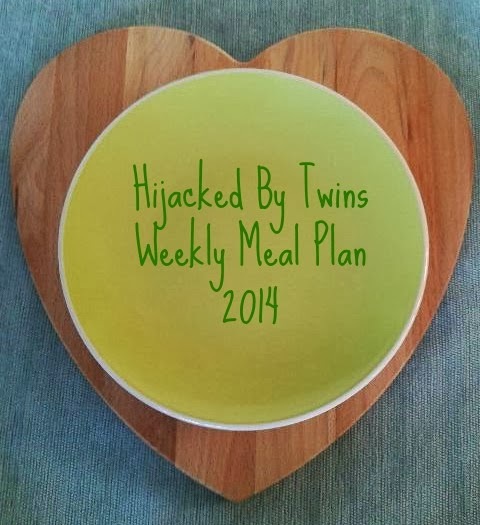 So here is my first weeks meal plan for 2014! My meal plans will not be restricted to certain days. I will be listing 6 meals that I will be cooking over the week. I'll only be listing 6 as we go to my mum and dads for our Sunday dinner! I make this with steak mince, red onion, garlic, courgettes and peppers in a herby tomato sauce. I find that this is a really versatile meal so I always make more than I need so that I can make an easy alternative meal the following day! With the left over beef and chunky vegetable sauce I will give it a twist and create a new, different tasting meal. I will use the sauce as I would a cottage pie and top with creamy mashed potatoes. I always give the top a generous sprinkling of grated cheese that go lovely and crispy under the grill! I love making a good, hearty pie during the winter months. I always find pies to be warming, comfort foods. I am also taking part in Keynko's 52 Cook Books so this is going to be this weeks recipe! When I looked in my freezer I found that I still have sausages left from Christmas so I thought I'd make a family inner this week and do a toad in the hole with roasted carrots. I love to add not just sausages to my toad in the hole and will be adding some roasted carrots to the mix this week! I also found in my freezer some lovely casserole steak. So one day I am going to put a stew in my slow cooker and leave it to tenderise for the day! Dumplings will be added to this dish of course! This week I bought a bag of couscous for a change. This week I plan to make a tuna couscous dish with mushrooms, red onions, diced peppers and garlic. This will be my easy meal for the week. This one will be saved for a day when time has not been on my side! Ohh yum! Everything sounds great! !